Jaguars defensive end Calais Campbell wants to get back to the playoffs so badly that he’s willing to restructure his contract. ORLANDO, Fla. — Jaguars defensive end Calais Campbell wants to get back to the playoffs so badly that he’s willing to restructure his contract. Campbell has already had discussions with the Jaguars and acknowledged that it could happen. Campbell, who signed a four-year, $60 million free agent contract with the Jaguars in 2017, has a $14.5 million salary cap number in 2019. Campbell has made a tremendous impact on and off the field since his arrival in Jacksonville, though. After setting a franchise record with 14 1/2 sacks in 2017, Campbell led the team with 10 1/2 season last season. 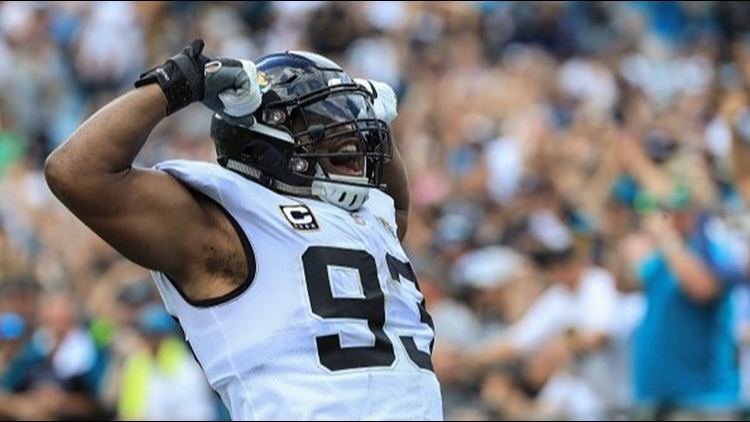 Earlier this month, Campbell became the first Jaguars player to win the Bart Starr Award, which recognizes one NFL player who best represents outstanding character and leadership in the home, on the field and in the community. Campbell will be presented the award on Feb. 2 as part of the Super Bowl events leading to the Feb. 3 in Atlanta. Now, he’s back playing in the Pro Bowl for the fourth time since 2014, joining teammate Jalen Ramsey on the AFC team that will play the NFC on Sunday at 3 p.m. at Camping World Stadium in Orlando. As a second alternate, Campbell was selected on Monday to replace Houston’s J.J. Watt, who is unable to participate due to injury. With Campbell agreeing to a possible contract restructure, it could help the Jaguars acquire additional cap space to make a stronger push if they decide to pursue Philadelphia Eagles quarterback Nick Foles in free agency. Foles, who is expected to be one of the top quarterback free agent options on the market, is likely to to command a salary that will exceed $20 million per season. The Jaguars are likely to release Blake Bortles, though his contract would still count $16.5 million in dead money before June 1 or $11.5 million if he released after that date. The Jaguars, who were 5-11 last season after going 10-6 and advancing to the AFC title game in 2017, are in desperate need for a playmaking receiver, improved depth on the offensive line and more consistent play at quarterback. Campbell said he is willing to help recruit free agents to play for the Jaguars.